Although the concept of the monarchy has been alien to Filipinos born in the republican era, there has nonetheless always been interest in the pomp and pageantry of the British royal family in this country. The family’s latest member, as everyone by this time already knows, is George Alexander Louis, who first saw the light of day on 22 July 2013. 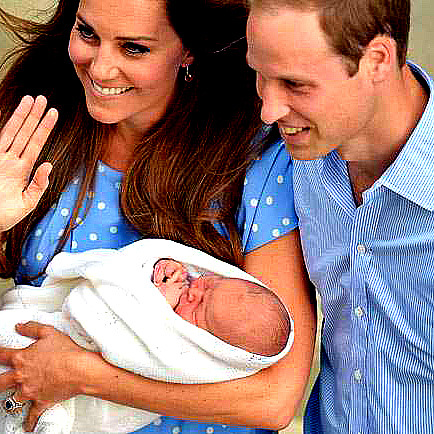 The newborn is now also known as Prince George of Cambridge, first-born child of William and Catherine, the Duke and Duchess of Cambridge; and third in line to the British throne as provided for by the monarchy’s automatic system of succession. In this system, the first-born male son of the royal couple in what is called the direct line of succession takes precedence over other siblings. Ahead of Prince George in the direct line of succession are his father, who is second in line to the throne; and grandfather, Prince Charles of Wales, who is first in line. Had he not done so, the newborn George Alexander Louis will probably not even be anywhere near the top of the succession line. It was just one of those things that can change the course of history forever. Keeping everyone waiting all these years has been Her Majesty Queen Elizabeth II, now 87 years old and less than three years short of the reign of Queen Victoria, Britain’s all-time longest reigning monarch. Elizabeth II has been on the throne since February of 1952 for a total of 61 years and counting. Victoria reigned from June 1837 to January 1901, a few months short of 64 years. In a manner of speaking, the unfortunate ‘victim’ of Elizabeth II’s long life and reign has been her own first-born son Charles, now just a few months short of his 65th birthday. One of the major international magazines ran a cover story on Charles in 1969 entitled ‘The Man Who Will Be King’ after the televised investiture ceremonies that formally bestowed upon Charles the title Prince of Wales. It has been 44 years since; and Charles is still not. Charles’ first-born son William, second in line to the throne, is now 31 years old. He is five years older than his grandmother Elizabeth II was when she became Queen of the United Kingdom. As for the newborn George, if the time ever comes that he gets to sit on the throne of the United Kingdom of Great Britain and Northern Ireland, he will be the seventh king named George to do so. That is, if he decides to ascend the throne using the name he was given at birth, which has not always been the case with the country’s previous monarchs. There is also the little matter of his grandfather Charles reportedly having considered becoming George VII if and when he gets the chance to become king. This is reportedly in honour of his own grandfather George VI, father of Elizabeth II, who passed away in 1952. Although the matter has not really been decided, if at all then baby George, if he decides to use his given name, will become George VIII. As a matter of trivia, George I, the first king of the United Kingdom to bear the name, was not even from the kingdom. Queen Anne’s death in 1714 left the kingdom with a succession problem, inasmuch as the so-called Acts of Settlement excluded Roman Catholics from the succession line. George was a cousin of the royal family based in northern Germany. He was invited on the condition that certain powers of the throne were to be turned over to Parliament. Thus, his reign was critical to the evolution of governance in the kingdom into a modern day constitutional monarchy. George II, III and IV all reigned after George I, founder of what history calls the House of Hanover. The line came to an end in 1837 with the death of Victoria. Victoria’s son Edward VII inherited his father’s names and so is considered the founder of the House of Saxe-Coburg and Gotha. The outbreak of World War I saw the United Kingdom and Germany fighting on opposing sides. Because the name Saxe-Coburg and Gotha sounded German, the house was later renamed the House of Windsor. George V was the first king of this house. The lengthy rein of Elizabeth II would not even have happened had the direct line not transferred from her uncle, Edward VIII, to her father George VI. Edward abdicated in 1936, less than a year after becoming king. Because of his abdication, the direct line of succession transferred to his younger brother George.